Published: May 19, 2017 6:12 a.m. ET AFP/Getty Images Saudi Arabia's minister of energy Khalid A Al-Falih in Vienna, on June 2, 2016. By SARASJOLIN MARKETS REPORTER BIMANMUKHERJI Oil futures moved sharply higher on Friday, as investors showed some optimism about what will come out of next week’s meeting of the Organization of the Petroleum Exporting Countries. Up for final discussion by the cartel is whether to extend the current six-month production-cut deal beyond the mid-2017 expiration, and if so, for how long and whether the reductions should be increased. It is widely expected an extension will occur, and energy officials from Saudi Arabia and Russia this week signaled they back a nine-month extension. That helped give oil a start-of-week gain that’s been built on since, putting crude on pace to modestly top the 3.5% jump logged last week. After settling Thursday at three-week highs, light, sweet crude futures for delivery in June CLM7, +1.64% jumped 59 cents, or 1.2%, to $49.93 a barrel. The contract briefly topped $50 a barrel for the first time since April, according to FactSet data. July Brent crude LCON7, +1.77% on London’s ICE Futures exchange also gained 59 cents, or 1.2%, to $53.10 a barrel. Li Li, energy research director at ICIS China, attributed Friday’s advance to pre-meeting optimism, but said she doesn’t “expect prices to jump hugely from the current trading range.” The presidential election in Iran was also grabbing oil trader’s attention on Friday. Commerzbank analysts said the result could have “major consequences for the oil market” if conservative cleric Ebrahim Raisi wins the vote. Raisi and reform-oriented incumbent Hassan Rouhani are leading the polls. Read: Iranians head to the polls in high-stakes presidential election Raisi has expressed criticism of the nuclear agreed in 2015 that paved the way for the U.S.-led sanctions to be lifted and allow Iran to sell oil on the international energy markets. If Raisi wins “the agreement in its current form would risk being overturned. New sanctions would then very likely be imposed by the US and the West, which could reduce the oil supply from Iran even in the short term,” the Commerzbank analysts said. “An election victory for Raisi would therefore drive oil prices up noticeably,” they added. Read: The overlooked upside for oil in Iran’s election Later on Friday, oil prices would also be steered by the latest weekly U.S. rig-count data from Baker Hughes. That report has shown 17-straight weeks of growth in active oil-drilling rigs. But government figures on Wednesday showed the first week-to-week drop in domestic oil production since February, a development which also helped lift crude prices this week and get light, sweet crude back toward $50. To some, the past two weeks’ price rebound was to be expected after April’s slide. That drop “was a case of sentiment over substance,” said BMI Research. It sees more price gains to come the next several months, but they “are more likely to be incremental rather than exponential.” As for oil products, Nymex June gasoline futures RBM7, +1.72% rose 1% to $1.62 a gallon, while ICE gasoil gained 1% to $469.75 per metric ton. Natural gas futures NGM17, +2.36% advanced 0.8% to $3.21 per million British thermal units. WEDNESDAY! Here we are again, and boy does it feel good! Teaser: Part of todays update is VIP only. --> JOIN HERE <-- VIPs, please read this post before continuing to the VIP portion. It should be noted, and kept in mind, that Ramadan this year starts on the evening of Friday May 26 and goes through Sunday June 25. That's 9 days from now. Those of you that have been traveling this road with me for years know that I have always been VERY adamant that "nothing gets done during Ramadan"... ... but I'm starting to lean a little to the left on that commitment. There is just TOO MUCH happening right now! There are a couple key elements to this, and I'm going to give some specifics and then explain the parameters that will make me go "Full Buzzy" in spite of the upcoming holiday that traditionally yields 0 "real" progress for anything in Iraq. For some months now, I've been very optimistic about Iraq's ISIS situation. Over the last few days, this has only increased. Examples: Major news announcements This next thread has been going since last month, and the evolution of tone and events is very encouraging! I'll link you right to the most recent articles, currently on page 25: Oil and Energy continue to make progress, FINALLY! This is the exact area where we were stagnant last year. This year is different - the consistency of these articles lately is a telling sign. Speculation: New ration cards to be issued next week. Could these be tied into the upcoming changes in the entire Iraqi banking system, which will ultimately incorporate new currency, ATMs, and a new rate? It's a possible "gateway" move. Further speculation: I have some thoughts on the date. In fact, I am finally confident enough in this to outline my thoughts on WHEN we might see this happen... but that's for VIPs only. (Hint: It's soon!) VIP members, click here: --> https://goo.gl/NrgHjm <-- (If you're not VIP, NOW might be the best time ever! The "price" of becoming VIP is less than $1 per day. The cost of not being VIP is almost impossible to calculate.) My responses to my discussion on the "DATE" will only be in the VIP section. Here's the weekly Q's! ===================================== Your question actually anticipated my thoughts for this week almost perfectly! (FYI, I don't read the questions before I do my weekly update. I get my thoughts out, and then I read the questions.) For once, I actually agree that something might get done during Ramadan. *shock* *GASP! * You're a VIP member... go read my update in the VIP section. That will explain more. 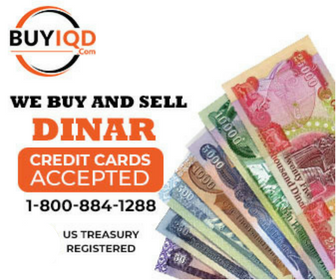 I'm not sure what you mean... if you exchange IQD for USD, then you lose any future gains that the IQD may make. Did I misunderstand your question? I apologize if I did! #DavisForPresident! If this is on track with what @Happy Man was asking, I'll just thank olivesman for chiming in Good sign - ABSOLUTELY yes! ISIS has been losing their battle for long enough that I haven't given them a major place in the RV progression lately, but the news that Iraq is prevailing - strongly - is very welcome! Any other delay? See my post in VIP. ====================================== That's it for now! I want to wish you all a GREAT Wednesday and of course... GOOOO RRRVVVVVVVV!!!!!! Adam Montana P.S. VIPs, https://goo.gl/NrgHjm !!!!! See you there. Happy Friday everyone! If you hadn't noticed, I'm watching this OPEC situation like a HAWK... this is getting serious! We all view the word "soon" with a bit of disdain, but it's starting to taste a little better every day. This rolled across my desk bright and early this morning: But the real reason for this post is to clarify the next OPEC meeting date. I was mistaken earlier this week, the meeting is not on the 27th... it's on the 25th. Ramadan starts on the 26th. Could the 25th or 26th be our day? It's possible, if Iraq is given a clear exemption from the OPEC oil production deal (the same deal that Russia and Saudi Arabia have already agreed to). It's not time to celebrate YET, but I'll tell you this much... I'm being advised to close the doors on VIP no later than mid-day May 25th. THAT is not something that happens often! Especially not this far in advance. Before that happens, I want you to have a chance to get in - so in hopes of a MASSIVELY AWESOME MAY 25th, I'll give you a 25% discount coupon to sweeten the deal for you. Use code "goRVmay25" in the store. This is only good for VIP upgrades, not the text service. Also, it's only good for the 5 month or Lifetime options - you have to be willing to stick with me for at least that long to get this discount. (the code goes in the "coupon" box on the checkout page http://dinarvets.com/forums/index.php?/store/category/1-vip-membership-packages/ ) And I'll be in touch with you VIPs over the weekend on some other items. GO RVVVVV!!!!!! Hey DVers. Today, August 12th, is my birthday. And all I'm asking for is a revaluation of the Iraqi dinar. If not today, then in the immediate future. That is all. Thanks everyone and have a good day!